Flatfeet is a condition defined by the lack of an arch on the inside of the feet. Instead, the foot is flat and touches the floor entirely while standing. Often, the condition causes no symptoms, allowing most people with flatfeet to live normal, pain-free lives. However, some people have pain or discomfort associated with flatfeet and may experience knee or ankle complications as a result of the condition due to degeneration of the tendon that primarily supports the arch of the foot. that some people are born with a genetic predisposition to flatfeet, while others develop the condition later in life? For people who develop flatfeet over time, the most common risk factors are obesity and aging. These conditions can lead to a weakening of the tendon that supports the arch, allowing it to fall over time. Other risk factors include foot and ankle injuries, as well as some chronic conditions like rheumatoid arthritis. How do I know if I or my child has flatfeet? Adults can identify flatfeet by a lack of arch on the inside of the feet. In children, the condition is less obvious, as arches normally develop over time during childhood. In fact, it is normal for infants and toddlers to have flatfeet. Many parents notice flatfeet by ages three to five if the arches have not begun to develop yet. When should I see an Orthopaedic Foot and Ankle Surgeon about flatfeet? Many people with flatfeet live their lives symptom-free and without complications. However, you should see your doctor about flatfeet or fallen arches if you have swelling, foot pain, ankle pain or knee pain related to flatfeet. What types of treatments are available for flatfeet? A doctor may visually examine your foot for flat arches and order imaging tests to determine the underlying cause of the condition. Initially, foot orthotics and/or devices and physical therapy may be helpful for alleviating symptoms associated with the condition. 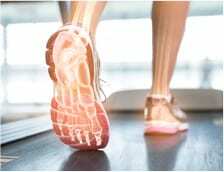 However, some patients require surgery for flatfeet – especially if the condition is caused by a degenerative or ruptured tendon (Posterior Tibial Tendon Dysfunction).